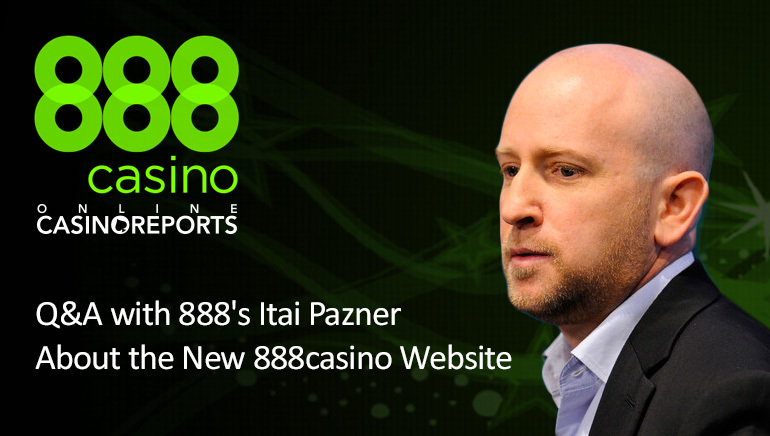 Online Casino Reports sits down for an exclusive interview with Itai Pazner, Senior VP at 888holdings, discussing launch of the new 888casino website and accompanying promotions. One of the best known names in the online casino industry, 888casino, has launched a new web site recently. We caught up with Itai Pazner, Senior Vice President and Head of B2C Division at 888holdings to talk about these changes and plans for the near future. The redesign of the 888casino website brings a fresh look and feel to the established brand with 20+ years of experience in the business. With a name that players know and trust, 888 always strives to improve the overall experience and offers something new and exciting to their players. Alongside visual changes, there are accompanying new promos, including a no-deposit-bonus wheel registration which should attract a number of new customers. Furthermore, the knowledge base on the site was improved to give players a better insight into different game rules and other useful info. Mobile user experience has also been improved to add to the already high quality playing experience. The site redesign and implemented changes, coupled with an amazing VIP program, which is already one of the best in the industry, should further establish 888casino position as the market leader. Read the full interview with Itai Pazner below to find out all exciting details about the redesigned site and interesting new promotions accompanying the launch. What would you say are the most exciting changes about the new website? We wanted to bring a totally new look and feel to the 888casino site, which we have certainly achieved here withleading-edge UX technology, in-house innovative design and state-of-the-art educational content. Alongside the fresh layout, we’ve introduced some amazing new offers for our players to enjoy, including a no-deposit-bonus wheel registration offer, which is already proving itself. How does the new website better help customers? We wanted to provide our players with a much richer gaming experience and we’ve done so by providing educational content through fun features that our players really get to benefit from, including easy-to-follow explanations of games and rules, useful game data and winning history patterns. We’ve pulled out all the stops in providing our players with the utmost in user experience and a smooth and intuitive consumer flow. We have also enhanced the overall 888casino mobile experience, its presentation, and its seamless navigation. Are there any promotions running in tandem with the launch of the new site? Our fresh new look comes complete with some amazing new promotions - we’re giving our players something to really get excited about. Let’s start with the no-deposit-bonus that greets players upon registration – before the player even needs to make a deposit, we are giving them the 888casino welcome… All they have to do is spin the Wheel of Fortune and they’ll get anything between £/$/€15 up to £/$/€888 free to get started with. Are there any developments planned for the website in the near future? Of course! Good things should keep coming, which is why we are continually working on developing new games, features and tools to add to the colourful mix. We also have our very own in-house team so that we can bring unique and exclusive additions on-board and we actually have some exciting new games in the pipeline for the very near future. We want to make sure that each and every one of our players is as happy as they can be at 888casino and so the advancements never end. The same goes for promotions and offers – developments are the way we do things here at 888casino – we make great promotions even greater so that there is always something new and attractive for our players when they enter the site. What sets your website/brand apart from the competition? With nearly 20 years of award-winning experience in the online gaming industry supporting us, we do have that major advantage over our competitors and a name that people trust. As mentioned, we are fortunate enough to have our own in-house expertise and so we are unique in that we get to create exclusive casino games that host some of the biggest jackpots anywhere online. We also proudly host an incredible platform of Live Casino games that, due to popular demand, we are adding new tables to all the time. Our live dealers are the best in the industry and we keep our live casino players happy with treatment that honestly can’t even be topped at the casino floor itself. Then there’s our outstanding VIP Program, where it really is red carpets all the way. Our VIP’s not only receive exclusive rewards and promotions, but they also get their own personal VIP Account Manager and if they’re lucky, they could find themselves at some of the classiest attractions around the world at one of 888casino’s exclusive VIP Events. Alongside the fresh layout, we’ve introduced some amazing new offers for our players to enjoy, including a no-deposit-bonus wheel registration offer, which is already proving itself. We’ve pulled out all the stops in providing our players with the utmost in user experience and a smooth and intuitive consumer flow. We have also enhanced the overall 888casino mobile experience, its presentation and its seamless navigation. We want to make sure that each and every one of our players is as happy as they can be at 888casino and so the advancements never end. The same goes for promotions and offers – developments are the way we do things here at 888casino – we make great promotions even greater so that there is always something new and attractive for our players when they enter the site. Thanks Itai for taking the time to talk with us! Our readers are invited to check out 888casino's new website.